Is Flipkart Deliberately Delaying Deliveries To Promote “Flipkart First"? Flipkart is a lighthouse ecommerce example when it comes to customer service. Before Flipkart came in, customer service in ecommerce was a joke in India. I would not be exaggerating if I said that they were the ones who showed the path to others on how to offer great customer service. While there have been some exceptions to that, generally they have had an excellent track record of timely shipping and after sales support. I have personally placed umpteen number of orders over last 5 years, and more often than not they have surprised me on the positive side. However, things seem to have changed over past few months, especially when it comes to timely shipping. And, unfortunately, I strongly suspect that delay in shipping is quite deliberate. I have placed couple of orders over past month or so, and the shipping has been surprisingly slow for me. One of them was for Table Tennis balls which I have been ordering once every couple of months for past 3 years, and Flipkart has never delivered it so late as it did the last time. And, it is just not me, many people on Twitter and Facebook have been increasingly complaining about the same. And in our view, the reason seems to be Flipkart wants to push their paid premium service Flipkart First! Before Flipkart announced their expedited (paid) shipping services like next day deliveries or even same day deliveries, generally the Flipkart orders used to land at buyers place in less than 48 hours. Infact, more than half of my orders with regular free shipping option came in next day and in about 95 percent cases it took maximum of 2 days! Their fast shipping was one of the reasons, Flipkart customers loved them! Flipkart orders are now taking over 3-4 days (or even more) to reach customers. This way, they are creating a need for expedited deliveries. They have launched “Flipkart First” service that offers expedited in-a-day delivery free of cost along with priority customer service. Before it was launched, although it was not guaranteed, most customers would as-is get these services free of cost. Now unless Flipkart delays regular shipping for non Flipkart First customers, they will not be able to create market for it! On the other side, if I have to play devil’s advocate, one of the reasons it may be happening is because Flipkart First customers are getting priority on their orders, so regular customers are getting pushed back and hence the delay. However, this does not explain why the delays have happened before “Flipkart First” service was launched? I leave it upto our readers to come to a conclusion, but in my personal view, regular customers are going to suffer because of Flipkart First, and the suffering, in some cases, may be quite deliberate from Flipkart. Do let us know your views on this! 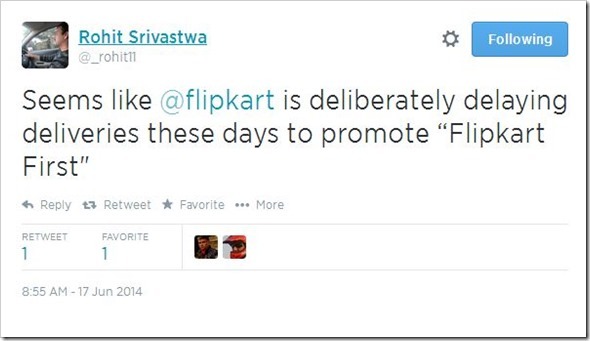 "Is Flipkart Deliberately Delaying Deliveries To Promote “Flipkart First”? ", 5 out of 5 based on 1 ratings. I have ordered a lot of products on the big billion day. One of them was a asus fonepad 7 which was received after 8 days and it was DOA. After i asked for a return and it is accepted and still no sign of the flipkart guy who will take the damaged one and replace it with a new one.And the other which were ordered on the same BBday are still not delivered even after 12days (today) all of them are stuck in our city warehouse since last 8-10days.Previously flipkart used to deliver in max 2 days in my location but now-a-days it want to promote the flipkart first by delaying the delivery of ordered products by weeks.In the other hand i have ordered a lot of products from amazon during this period and most of them reached to me in max 4-5 days. So i think this was my last purchase from flipkart and i won’t buy again from flipkart as flipkart is not trustworthy anymore at least to me. I’ve also ordered moto g on 6th october (#big billion day). Haven’t received it yet. I’ve tracked the order and it is lying at the warehouse in my city since 2 days. I Agree and I truly believe its true. Before Flipkart First I would get deliveries in 2 to 4 days and by paying Rs 70, I could get delivery next day. I am Flipkart First member now and staying in Pune. For me all items are showing delivery after 7 to 10 business days. I am supposed to get priority service but that too is not true. They take 3 days to reply to me. I have emailed questioning why i am not getting next day delivery but so far no reply. I totally agree. I have placed my order on 6th October as per company policy normal product delivery duration is 3-4 business days…but I haven’t recieved my product yet..order is being approved but not processed by the company..
I’ll be surprised if the delayed shipments were ordered from WS Retail which is Flipkart’s own inventory. For other sellers its justified that they take (ideally shouldn’t) more time because they might not always be shipping from the buyer’s own city. I guess the first thing to note is that, the one-day or same-day delivery might not make sense in this market and a need is now being created. Won’t be able to say its cheating or not, but definitely a business practice that competitors might cash in on. Agree. I’m in Bangalore and earlier we used to get items delivered within 48 hours without any hassle. Now, they say they will deliver in 7 days! Just cancelled my order. Thanks but no thanks. Myntra delivers within 24 hrs from the same location better than I ever expected.